Pres. Felipe Calderón visited Harvard University Monday and gave a speech at the Kennedy School of Government to a crowd namely composed of Mexican press, Mexican dignitaries (among them Luis Carlos Ugalde, former president of the Federal Electoral Institute during the past election) and Mexican students at Harvard (both U.S. and México-born). He was accompanied by his wife, governors of some Mexican states (I’m sure they were panistas), and a large press corps from throughout México and the United States. Boston was his second stop in his first day of his first trip to the United States as President of México; earlier Monday he was in New York City and stopped by the United Nations. Mariachi Veritas de Harvard had the honor of performing at the JFK Forum before the President’s speech. We had seats reserved for us, so we were able to hear him and see him clearly. You can find a link to his speech (both video and audio) here. A bit before the end of his speech, Mariachi Veritas was escorted backstage to welcome him and play a song for him. When he came backstage and saw us, he smiled and immediately asked for the classic “El hijo desobediente”. We don’t know that song, but instead we played “El son de la negra” for him. He even joined us for the first chorus! 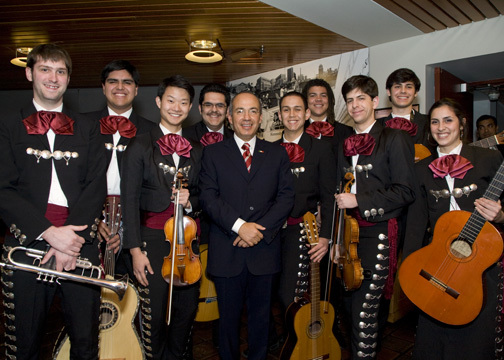 He was able to take a picture with Mariachi Veritas de Harvard before leaving. I thought it was strange for him to ask for “El hijo desobediente” but really respected his decision. Here is the song, performed by the wonderful Lucha Villa. It was not until I reheard the song a few hours ago that I realized why he asked for the song. The “hijo desobediente” is named Felipe. « ¡Guerra, guerra sin tregua al que intente de la patria manchar los blasones! Posiblemente quiere que lo entierren en tierra bruta. I want to join the Mariachi Veritas de Harvard. As an odd background dancer, of course. Sure you can join! Willing to fly out here from Texas? Our only Texan left the mariachi at the beginning of this semester. We sure need another Texan, and while we’re at it, another princess. De domingo a domingo, te vengo a ver.